Ribbon flowers have always been a crafter's favourite. They enhance the look of your projects. 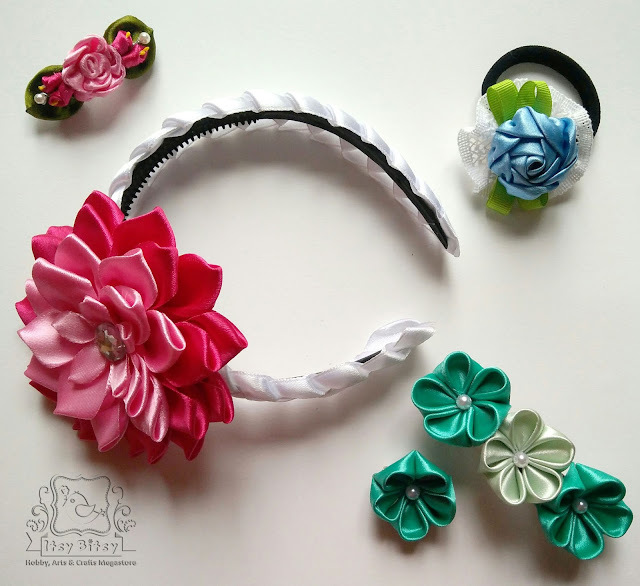 One of the best ways of using these ribbon flowers is in hair accessories.... Today I'm sharing how to make some of my personal favourite ribbon flowers on the Itsy Bitsy blog as a DT Inspiration and will use them in making some hair accessories. For this beautiful Hairband I have used different size satin ribbons, rhinestone, felt sheet, an old hairband (from my stash of hair accessories) & Itsy Bitsy's Silicon Glue (This glue saved me from using the hot glue gun for these accessories. I absolutely fell in love with it). Using a T-light candle I had sealed both the ends of all the ribbon pieces. Next I started shaping each petal. 1. Keeping the wrong side of the ribbon facing up, I folded the ribbon into 90° downwards from the centre. 2. Next I folded the A end and placed it on the B end as shown above. 3. Then folded the corners inside partially overlapping each other. 4. Lastly I held these folds securely with a straight tweezer and sealed the bottom edge using a T-light candle. ( just move the edge near the flame and not into the flame. Repeat till all the folds melt and stick to each other. While doing so make sure the edge is not burnt or the ribbon does not turn black). 5. Front look of the petal once the edge was sealed. 6. Backside of the petal. 7. I repeated the same process for all the ribbon pieces cut. Next comes the assembling of the petals to form the flower. Every petal is stuck to the base using Itsy Bitsy’s Silicon glue. 1. I used a 4cms cardstock circle for the base. Then start arranging the dark pink petal. The 1st layer had 11 dark pink petals which I stuck to edge of the circle. 2. The 2nd layer was again of dark pink petal. This time I stuck 9 petals slightly inner than the 1st layer. 3. 3rd layer had 7 - 1” light pink petals and 4th layer had 5 – 1” light pink petals. 4. 5th layer had 5 – ½” light pink petals. Lastly I added a big rhinestone in the center. Now lets see how I did the ribbon weaving on the Hairband. For the ribbon weaving I used ½” white ribbon – approx 5mtrs (the length on the ribbon may vary depending on the hairband size). 2. Then made a loop on the left ribbon and passed it through the right loop. 3. Next made a loop on the right ribbon and then passed it through the left loop. 4. Then pulled the left ribbon to tighten the loop. 5. To secure the entire weaving I turned it around and using silicon glue stuck the ribbon at the point the needle is inserted in the picture above. Once the silicon glue was dry, I snapped off the extra ribbon end seen below the needle. 6. After the weaving was secure it looked like this. 7. Then turned the entire weaving to the front and made a loop on the left ribbon and passed it through the right ribbon loop. Then pulled the right ribbon to tighten the loop. Step 3, 4 & 7 were repeated till I got the desired length of the weave. The length depends on the hairband size. 8. The ribbon weaving looked like this. 9. Once the desired length of the weaving was achieved, I secured the right ribbon end by sticking the ribbon at the point the needle is shown in the picture above. 10. Then the left ribbon end was secured at the back of the weaving at the point the needle is showing in the picture above. Once the glue was dry I snapped off the extra loop. 11. Finally the weaving was secured and the end looked like this. 12. Lastly I adhered the ribbon weaving to the hairband using Itsy Bitsy’s Silicon Glue and then adhered the flower to the hairband at the desired place. 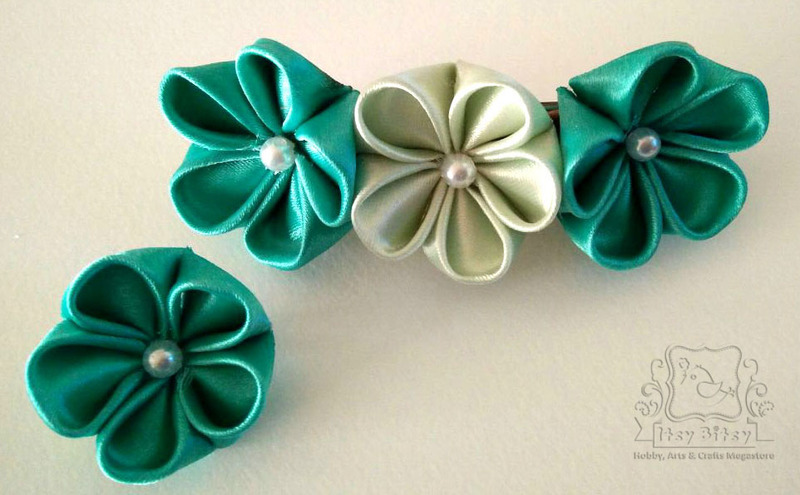 For this set of brooch pin & Hair clip I have used the beautiful Teal & light green colour 1” satin ribbon, pearls, felt sheet, barrette clip 85mm x 10mm, saree brooch pin and the amazing Silicon glue. Lets check out how these flowers were formed. 1. 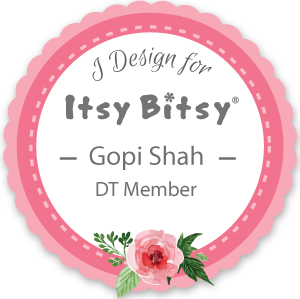 I started by covering the Saree brooch clip with felt sheet. 3. Next I took 1” light green satin ribbon and sealed its edge using a T-light candle. Then folded the ribbon edge diagonally as shown in the picture above and cut it at the inside edge. This gave me a square. I needed 5 such squares as the flower has 5 petals. 4. Here I took each square & folded it diagonally. 5. Then holding the ribbon as in picture 4, I made the right corner to meet the top centre point and sealed this edge using T-light candle. 6. Repeated the same with the other corner. 7. Lastly folded the petal backward and holding it with the tweezer as shown in the picture above, sealed the bottom corner from behind. It looked like pinched from the front. The same process was used to make 15 Teal colour petals. Once all the petals were ready I assembled each flower with 5 petal on a small cardstock circle with silicon glue and then stuck 1 teal flower on the saree brooch pin and 3 flowers on the barrette clip. This is my personal favourite out of all the hair accessories. The ribbon rose is just so beautiful and very easy to make. 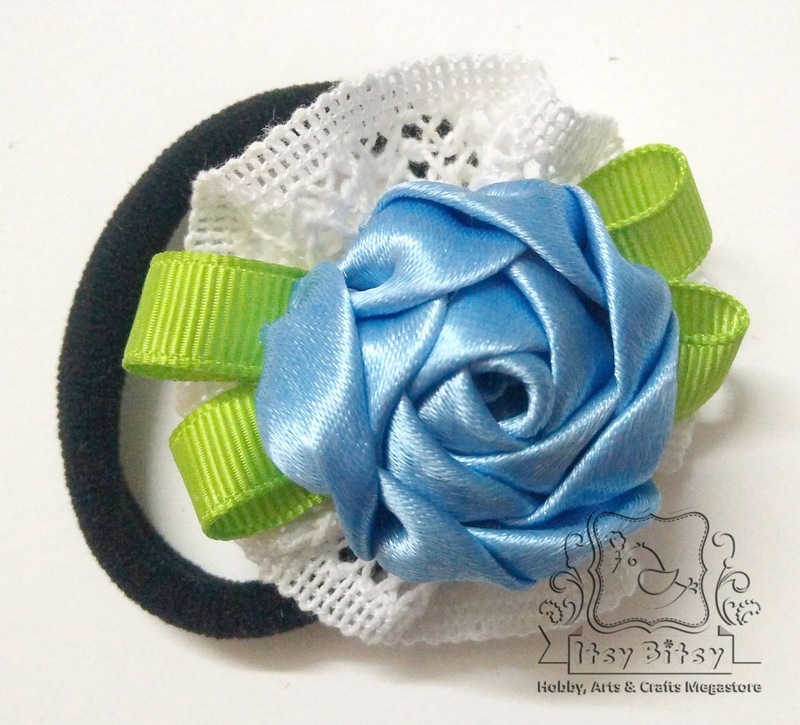 I have used 1” Sky Blue colour satin ribbon, white lace (from my Stash), green gross grain ribbon, pearl, black ponytail band (from my hair accessories stash), needle, thread and the best Silicon glue. Lets see how this beauty is created. 1. I started by folding the right bottom corner to the upper edge and then using a straight tweezer coiled the corner upto ½”. 2. Holding the coiled edge I started stitching (running stitch) the upper edge upto the folded corner. 3. Once the upper edge was secure with the running stitch, I folded the ribbon backward along the vertical edge. 4. And then the new formed edge was again folded diagonally as in step 1 to meet the upper edge. 5. Again I secured this open edge by running stitch. 6. I continued doing step 3 & 4 few more times and then slowly pulled the thread from the starting point against the ribbon to form gathered petals as in the picture above. 7. Again I repeated steps 3 – 6 till I achieved desired no of petals for the Rose. The last petal was then secured by a knot and the extra ribbon was cut. Lastly I started coiling the rose with my hand from the beginning point making sure that the base is flat and not conical. The last petal was secured using silicon glue. Now let’s assemble the entire band. 8. To give a base to the ribbon rose I had used a white cotton lace from my stash. I started with running stitch on the upper edge. 9. Once the desired length was achieved, I pulled the thread from the beginning point and formed a gathered flower. The end edge was stitched to secure it. 10. I had used the green gross grain ribbon to give a contrast colour and look of leaves. Just made simple loops as shown in the picture above and stuck all the layers in the centre using silicon glue. 11. The white lace flower & the green loops where then stitched to the black band. A pearl was used inside the black band behind the white lace flower to secure the stitch. This helped in avoiding the stitch to come off by fraying the band off. 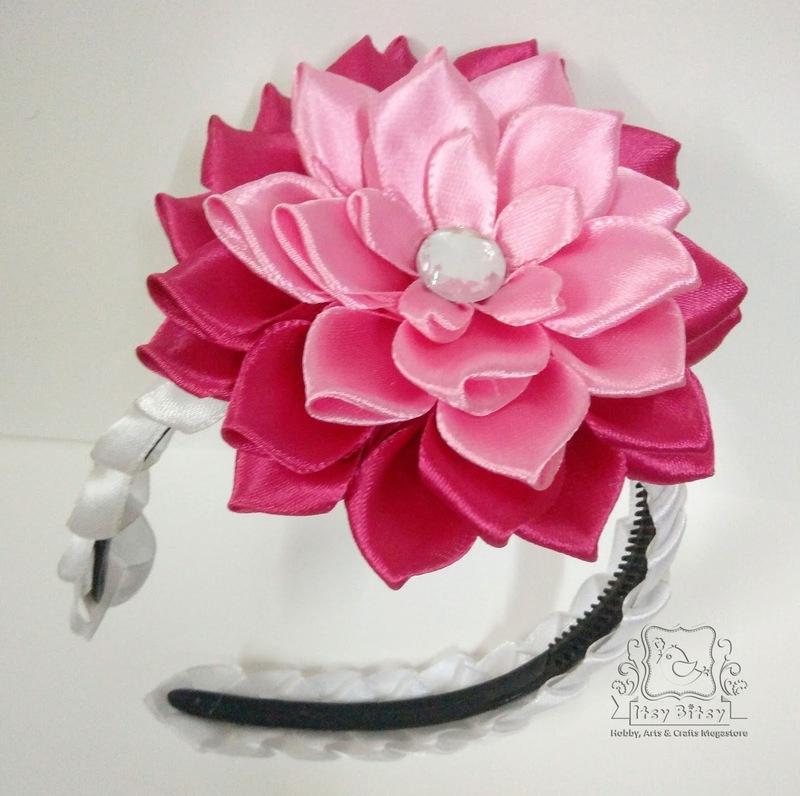 For this cute little hair clip I have used satin ribbons - 1” dark pink, 1” dark green, ½” light pink, pollens, pearls, mini barrette clip 50mm x 5mm, feltsheet and Silicon glue. So lets see how the clip was made. 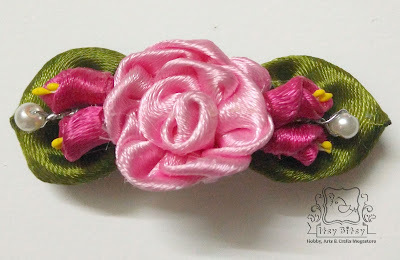 For the Light pink flower I have used ½” ribbon and the same technique of Ribbon Rose as discussed above. The ribbon size being small it looks a little different from the rose. Had also covered the mini barrette clip with brown felt sheet. For the buds I have used 1” Dark pink ribbon. 1. I cut a square out of the 1” dark pink ribbon. Sealed the edges using a T-light candle. 2. Then folded it diagonally. 3. Again folded it diagonally to get a smaller triangle. 4. Now holding the ribbon as shown in the above picture, I started coiling from right corner to the left corner. I maintained the bottom edge to be flat. Finally secured the end point with silicon glue. 5. Next i added yellow pollens to the bud using silicon glue again. 6. For fillers I made pearl stems using wire. For the leaves I have used 1” dark green satin ribbon. 7. I cut 2 pcs of 6 cms long 1” dark green satin ribbon. 8. Then keeping the wrong side of the ribbon facing up, folded the top corners to the bottom edge and then secured them by running stitch. Then pulled the thread against the ribbon to gather the bottom edge and secured it by a knot. 9. Lastly from the front using a straight tweezer I pinched the top and stuck it using a T-light candle. Finally for assembling the clip I used silicon glue to stick the flowers, then leaves, buds and lastly pearl fillers. Refer the picture above. All these ribbon flowers can be varied in size using different size ribbons. I hope you all liked the super long tutorial. Do leave some love below.